More often than not, when couples sit down in our studio for a design consultation — we quickly discover they have different styles. 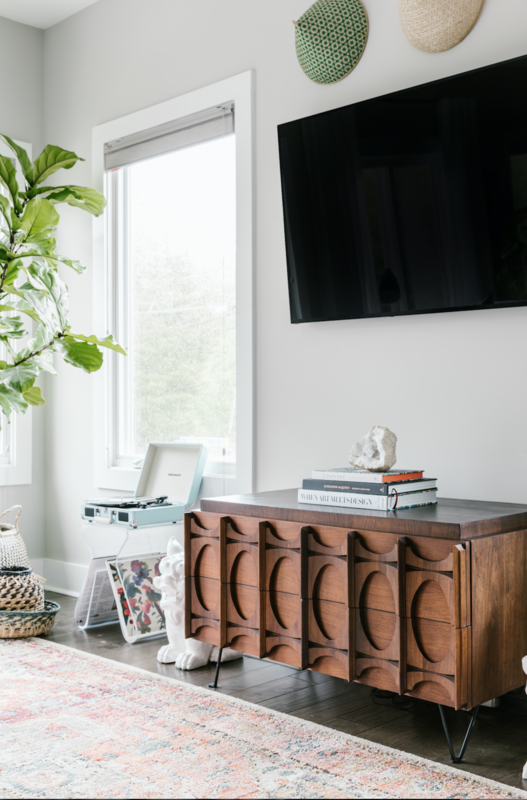 And most often, their design styles aren’t just distinct but they are opposite, like a West-Coast Cali-vibe lover married to someone set on Southern charm. But we love this. It’s always a fun design challenge to not just create a cohesive design but one that reflects dual personalities. We start by finding the common denominator — what’s something they both love and agree on? And then, we find what they are each drawn to and how we can incorporate must-have aspects from both clients. This design process means we get to know the clients really well, which we love, and we do so by taking them through a number of exercises. Pinterest is where we start, showing them galleries of images based on what spaces we’re designing. We watch for what they are each drawn to — and what they are not drawn to. This helps establish patterns for each person and we can find where they intersect. Almost always a color emerges that they both love. We also show them examples of our previous work and ask them what they like — and what they don’t. Is this kitchen way to modern? Dining space too traditional? Once we start to find their style — we start the compromise game. We may have discovered they both love blue, for example, so the designs reflect that vibe as the foundation. If he’s set on a leather couch with modern wood accents, maybe we jump for that piece but then soften the design with textiles and pillows that reflect her personality. Another trick we’ve found so unifying for most couples is to include an unexpected element in the design. 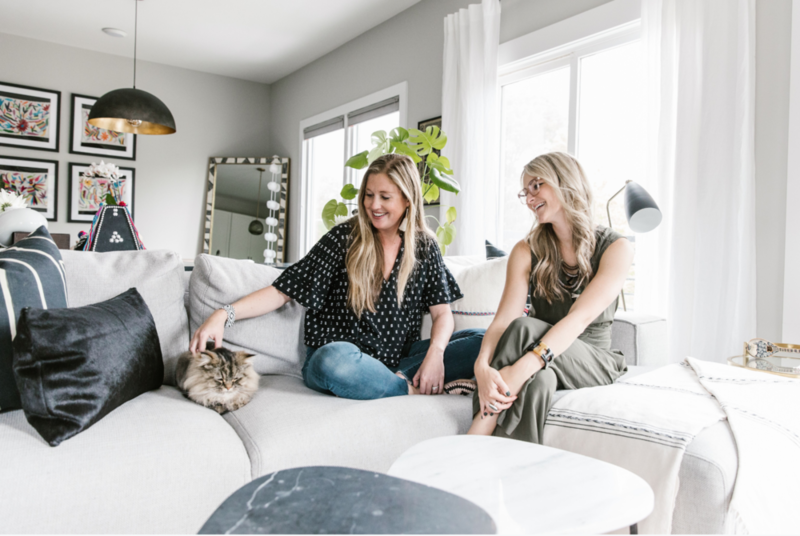 If it’s a one-of-a-kind light fixture — for example — often both clients are thrilled and drawn to it, and bond over that being in their space. Check out this dining space, as an example (shown above)! During the design presentation, immediately they both intrigued by this light fixture. The layered glass was unique and they both loved that they’d never seen it before. As for the rest of the space, we touched on his style with the modern, streamline table and chairs. We also incorporated a wallpaper that she loved, making the space welcoming and a room that reflects them both. Across CLT, we designed another dining space (shown above and below) where he was drawn to a textured light fixture and she — a bold wall color. He compromised on the bright paint for her, and she went for the light fixture and a rug he liked. The space sings to both of their styles. For the design of Kell’s house in NoDA, Kell and her husband Brad (who designs furniture!) worked together to create cohesive spaces. While Kell is drawn to modern and eclectic, if it was up to Brad — everything would have a mid-century modern vibe. They worked together in this dining space with chairs that have a nod to mid-century with the caps — but then incorporate Kell’s personality with the hide and curved bucket seats. They both loved the light fixture and across the space, incorporated a mid-century piece from Atomic Furnishings in Asheville. Their bedroom also reflects a unified design with them both loving the moody feel of the deep-toned walls. 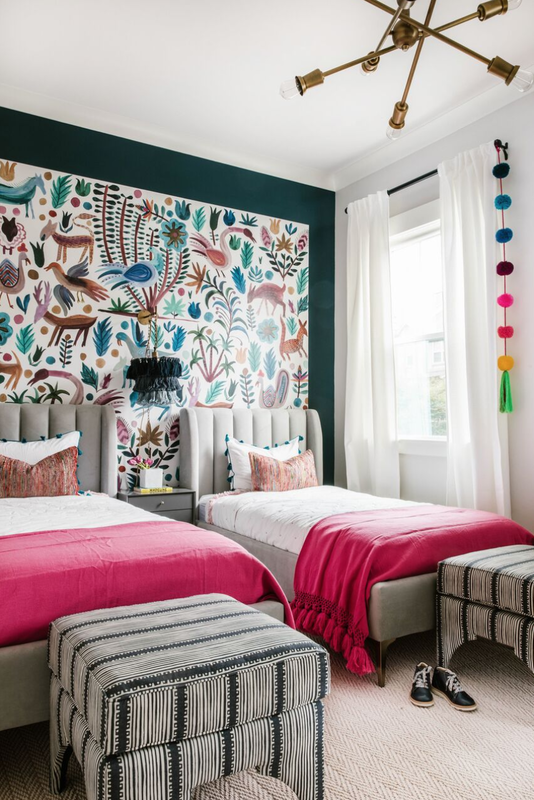 Off this vibe, the duo picked a mid-century piece that Brad had his eyes on with Kell’s pick: a velvet headboard and textiles that reflect her eclectic eye. It’s a pure mix of them both. Happy Valentine’s Eve! And cheers to all the couples who have pushed our designs to the next level with your distinct personalities and love for your homes! Introducing Our Guide to Sayulita! If you’re looking for an epic way to clear the winter blues, consider jet setting straight for Sayulita. It’s surprisingly affordable (check out this poolside VRBO villa! 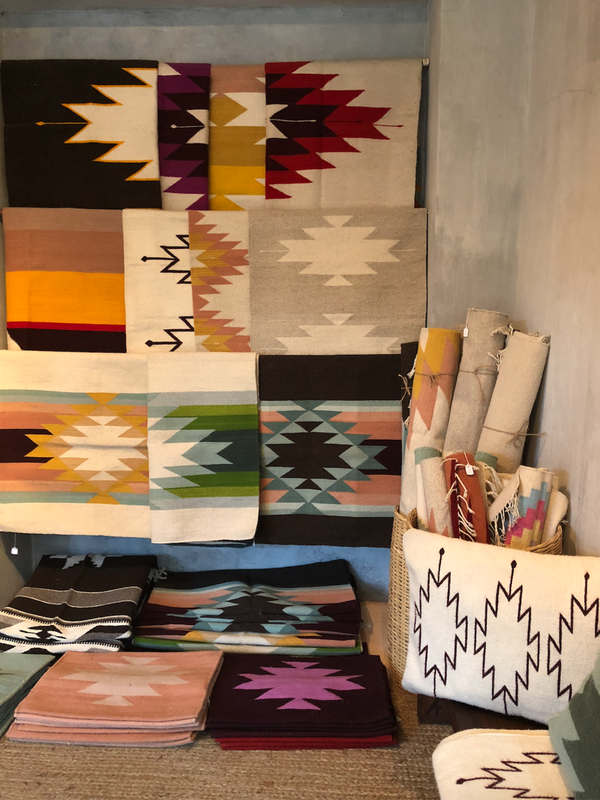 ), a short flight away not to mention incredibly beautiful and full of creativity that forever changed our perspective on handmade goods. We’ve created a downloadable Guide to Sayulita to make the trip enjoyable at every turn — best places to stay, eat, shop and enjoy a drink. 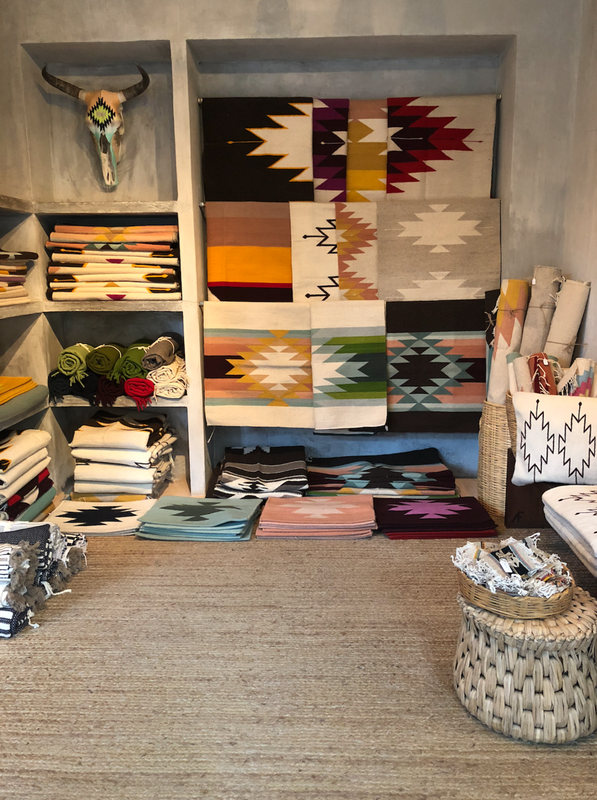 Here’s our inside scoop to Sayulita with stories from favorite moments, items we brought back — and a recipe to our go-to best Mexican cocktail (no matter the weather!). Quickly, we learned the Sayulita artisans are not only talented — but endlessly patient. 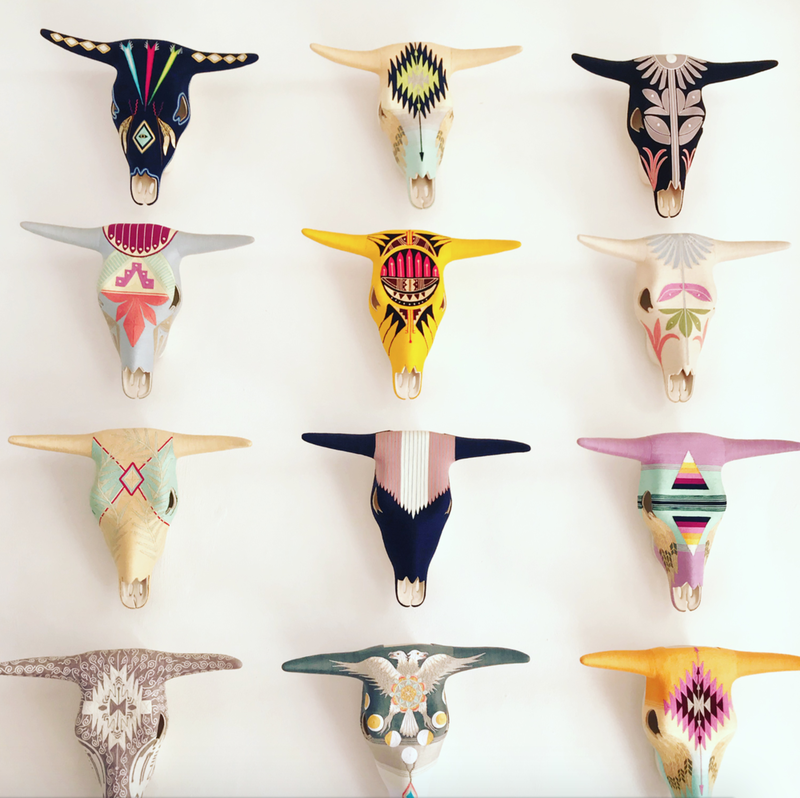 These gorgeous macrame masks had a high price point because they can take more than a WEEK to craft. Each stitch is handmade and the entire mask is covered in intricate, gorgeous designs. We snapped these photos outside the local shop, Evoke the Spirit, and wished we had time to sign up for a class — next time, we’ll work that into our agenda. Also — invest in a mask! Every time we think of this day, we regret not bringing back more and they’re stunning art pieces! A highlight of our trip was the Saturday market in the center of downtown Sayulita! Be sure to plan the trip around shopping this expansive market, it’s where we found all of our best handcrafted items. 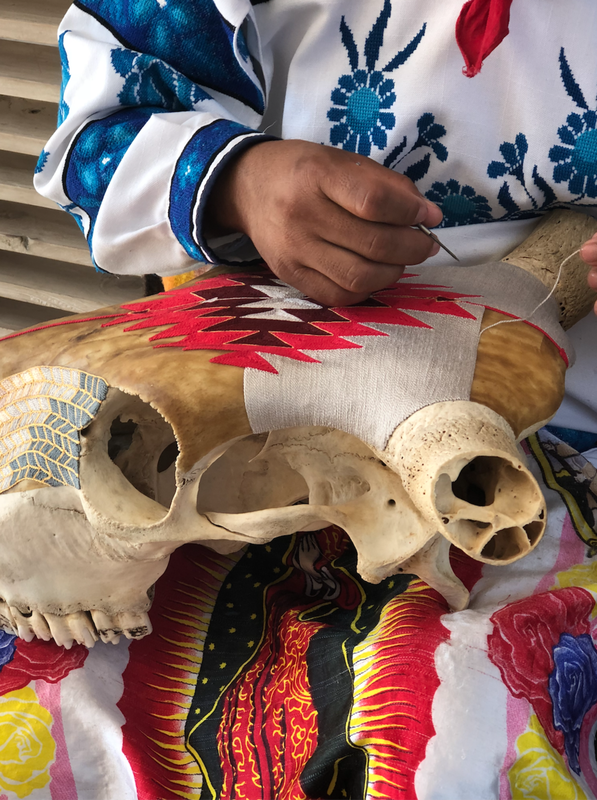 Artisans come from all over Mexico to sell their work at this market — from pom pom strands to otomi (traditional Mexican embroidery) to straw masks. No joke, we immediately bought up 60 strands of pompoms from white to bright, multicolored strands to turquoise and brown — we fell in love with them. Just to give you a glimpse: we were dying laughing trying to make a path in our hotel room — we had so many bags of pompoms we could barely walk through our space. We’ve loved working these pieces into clients home such as this little girl’s bedroom in Davidson, where our last multicolor strand was just the think to make her window more playful. 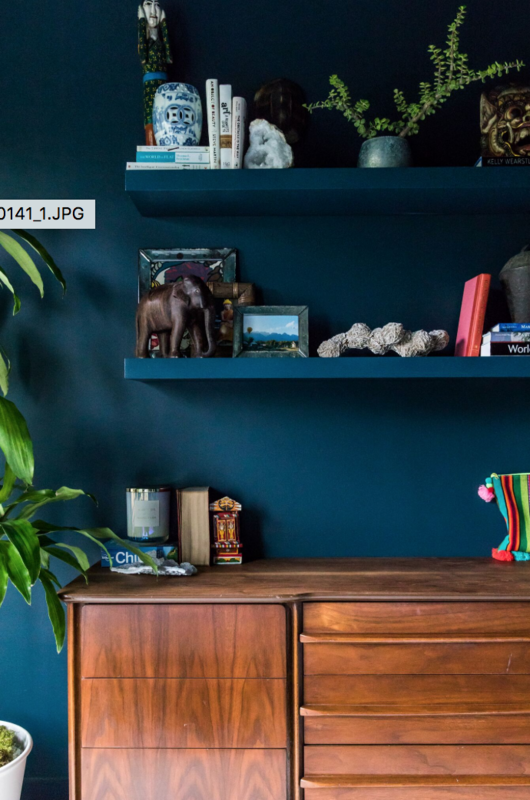 The straw mask added some personality to the open shelving in a client’s Uptown apartment — it was so him and the perfect finishing touch. We don’t just love the items in client’s designs — but we designed our personal spaces with these items in mind! In Kell’s living room, you can see that this corner includes a hammock handmade in Sayulita, a bright cactus planter we picked up at the Saturday market — and a mask handmade in Sayulita. Not only do these pieces add personality, but they give Kell a reminder of our adventures, and to keep a global, creative perspective. 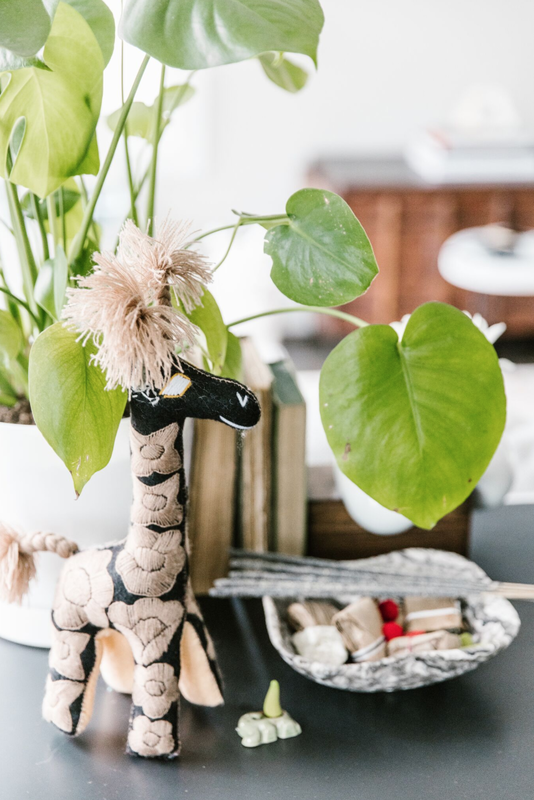 Our spaces are curated with things we love and items that evoke inspiration. A BEST memory of Sayulita was the hammock. 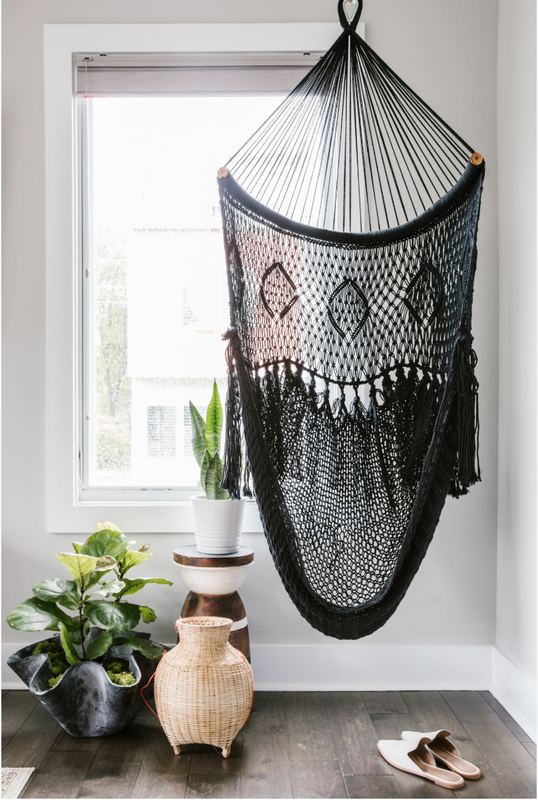 Kell landed in Sayulita with the goal of finding a black hammock for this corner and NO LIE — every local artisan we talked to told us that there was not a single strand of black string left in the town! We didn’t give up. By the end of our days in Sayulita, EVERYONE at the market knew who House of Nomad was because we were the blonde duo who kept asking for the black hammock. On the last day, one of the vendors met us with a black hammock they had just woven. So — she is extra special piece! A trip to Mexico would never be complete without some mezcal! We stumbled upon Cava, where we did a trio mezcal tasting — and that’s when our love affair with mezcal got deep. 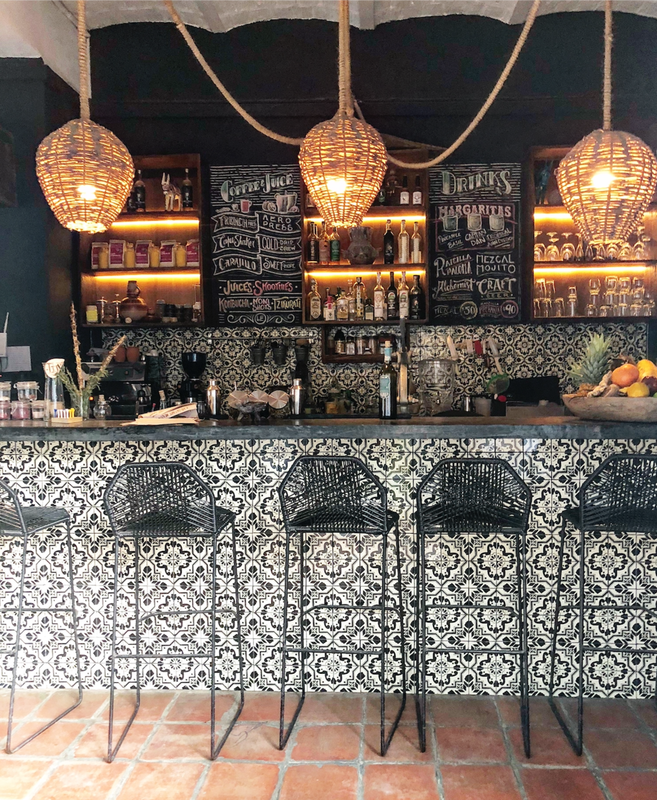 There are days we will just dream of these modern bar stools, the warm Sayulita wind pouring into the restaurant and the kick in our favorite mezcal cocktail. It’s absolutely delicious and they even passed along our favorite pineapple mezcal recipe from the trip! It is not only refreshing but has a good kick to it! If you can’t fit in a trip to Sayulita, at least make this drink for a wintry Charlotte day and help you dream of warmer days. Cheers! !